EMT Lisa Johnshoy has spent more than 20 years in the EMS industry. 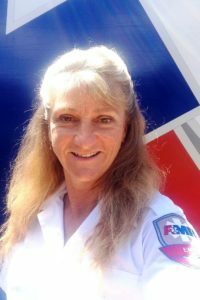 A member of AMR’s disaster response team and Hawaii’s Kalawao Rescue Team, Lisa also volunteers for the Kauai Life Guard Association and serves on the board of the Kauai Paramedics Association. In May 2016, Lisa was enjoying some time off when she witnessed a small airplane crash on takeoff. Lisa directed a friend to call 911, then grabbed a fire extinguisher, jumped the fence, and rushed to the crash site. Lisa and other bystanders pulled a victim from the plane, and she began CPR while directing others’ actions. Despite Lisa’s quick action and heroic efforts, none of the five crash victims survived. While a tragic loss, we can all only hope that in our time of need that someone with Lisa’s bravery and talents will be there to respond.